As shared with the sisters and volunteers in Lufeng dormitory of grade and mid school in China last 29th December 2010. In the course of my engagement with Pulangiyen youth, I have learned that to be an effective “teacher”, I have to accompany them in their dreams – to learn with them and be able to act with them in deciding like adults. Educating the youth challenges us to share in their aspirations. To do this, we must have hope – hope that allows the youth to accept themselves and the environment they live in with gratitude. 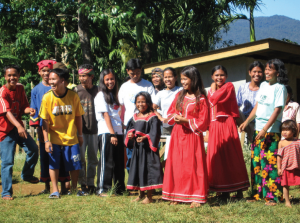 I share with you today eight points about our work in educating indigenous youth in the uplands of Bukidnon, Mindanao, Philippines. 1. “Goodness of today” – This is about conveying that the present context is good, and not communicate it as if it were someplace that we want to get out of quickly. It is important that each child is respected for who and how they are as they engage in the community, and their expectations are focused on the basic and attainable. Life is not too quick to change in an indigenous community. Nevertheless, the children learning about who and where they are in relation to the community allows for some surprising change in them. 2. Development of concepts in “two cultures” – Above average students will succeed in learning in the mainstream language, but ours is a community school focused on children belonging in and and sustaining their community in transition. The mother tongue is used by the local culture as the medium of instruction in school. The national language Filipino is taught as a subject and though the students may be initially slower in speaking the language, they have a stronger learning commitment and endurance in high school. 3. Teenagers are a new village group that has emerged with education. They want to act together and decide like adults. Traditionally by 14 or 16, they make life decisions, like pertaining to marriage. Now, they want to keep an active participation in their community. They need to learn to act out roles and actions. The best way to do this is by staging events and collecting cultural knowledge, stories, and songs from the elders. 4. Education is for the community and not simply for the top students to excel. With the use of the mother tongue as the basic environment of learning, the community is involved in the development of materials and in being a source of knowledge. Not all knowledge comes from outside, and neither do all development. More students go to high school as they feel part of a group and can survive better. Graduates return to the village as they feel they have a place there and see that they have a role to play in the community and that what they have learned can be integrated. 5. Identity and dignity are the primary strengths that a community shares with its young generation. The young feel a sense of belonging that they especially need when they leave their village. They do not view themselves as less than others and carry with them a self-acceptance and an ability to share and engage with others. 6. Indigenous Peoples have strength in using their culture. Culture has a role in many community actions, like in conflict management and in land allocation for better resource management. 7. It is important to develop the youth’s ability to organize events in their communities and to give them roles and skills training where they can excel. This allows them to have new levels of participation. 8. It is important to teach the youth about hope – hope that can help them restore their energy and teach them that sometimes things do not work as they wanted. It is hope that will allow them to look at themselves with acceptance and go forward with others.